We want to share our thoughts and beliefs, which we felt we had to get it out there to help the community to build on this new Green Economic model. We welcome you to our green page which is largely comprised of our thoughts, theories, and beliefs. We hope that you will find ideas and tips that you can use in you business and personal life. To join in this dialog you may reach EDL GREEN Team at contact@edlnc.com. When we talk about the environments in which a landscape design functions, we’re not just talking about the ecological environment. Many times we focus too hard on that particular environment because we are, after all, working with plants, soil, sunlight and water. But think about the social environment in which you operate on a day-to-day basis. Every plant has a life cycle, within which its useful life lies. As a Designer, we would need to optimize from this point of attack. In order to do this, we need to know exactly where in that life cycle the plant’s useful life begins. That point in a plant’s life is where either its transplantation (an immediate aesthetic effect) or the eventual fruition of its portion of the design aesthetic (a gradual effect) should take place. We also need to be able to predict where that useful life ends, so that you can plan for increased maintenance and, eventually, replacement. Pruning properly throughout a plant’s life – especially in its adolescence – will encourage that plant to consume bed space, reducing mulch and protecting adjacent structures like windows, walkways and the like.Everything has a life. During our lifetime we can experience and witness lifecycles of most living and mechanical things. With that knowledge and information, we learn better ways to maintain and to extend life. We can anticipate and renew at the proper time. Also, with this information, we know how to budget, when to cap expense and build a more efficient maintenance program. Attractive Environments that are in balanced with the local climate. They require minimal amounts of fertilizer, pesticides and water. Their outdoor spaces are functional, cost efficient, visually pleasing and environmental friendly.“If you can predict negative outcomes that happen under certain circumstances, you can avoid those outcomes.”Every living thing is sustainable, and where there is sustainability there is predictability. What that means is for every living thing on the planet, you can predict the period of time for which you can sustain its life. Every living thing on Earth requires certain environmental conditions in order to survive. Human beings have the greatest influence over these conditions of any animal. Since, to an extent, we can control environmental factors, we should design with the goal of removing obstacles that, in the past, have killed plants and wasted resources. Those obstacles include, but aren’t limited to, Too Close, Too Shady, Too Obstructive, and Just Too Much. You and I have contributed to all of these factors in our lives. In creating these landscape designs, we continue to be on a constant search for an opportunity to reduce waste. We’re always looking for ways to reduce waste from the perspective of a business owner, and with E-DESIGN™ we’re also looking for ways to reduce waste from the perspective of the environment. What we’ve found – and what you’ll find when you employ E-DESIGN™- is that the two perspectives are one and the same. Simply put, a sustainable design is one which has the greatest positive impact on the environments in which it functions while improving its environments’ aesthetic value. typically we tend to over water plants in the landscape. When this happens the plants have a natural defense to grow more shallow roots. Therefore, when drought conditions occur the roots are unable to get to the moisture below their conditioned root zone. Performing an audit of the irrigation system to examine the nozzle size to see if it is in proportion to the environment of which it is located (i.e., sun, shade and slope). Ensuring proper and consistent rotation, spray and time with frequency to optimize the volume of water applied on the plants is essential.In the Carolina Piedmont area, irrigation is rarely necessary after the second year in landscape. We have found that plant roots stabilize and tend not to need supplemental water to sustain them. By continuing to water you risk adversely affecting the root growth which reduces the sustainability of the plant. Risk is measured and controlled where possible. When a tree or plant begins to grow in such a way that its branches are damaging the siding or roof, at this point that tree could be considered a liability to the owner of the asset. Knowing the lifecycles and growth thresholds of plants enables a manager to anticipate these threats and take steps to avoid collateral cost. We have studied plants in relation to maturity sizes and growth rates. In the process, we discovered that they typically have three Growth Thresholds: Low, Moderate and High Maintenance. Growth Thresholds are the transition from one threshold to another. From that, we captured the time required to manage a plant in order to maintain it within the limits which is normally dictated by structures and limitations (i.e. building, curbs and walkways). The time required to maintain is identified by Low, Moderate, and High Maintenance. Moreover, we have determined that the time required to maintain a High Maintenance plant is more expensive than to remove and restore it with a low maintenance plant over 3 years.Specific plants grow to specific heights, specific widths, depths and densities of foliage. Given these facts, we can very easily predict plant maturity. We can predict what a plant will look like in a year, in five years, in ten. We can predict what a plant will look like when it reaches maturity, as well as how long it will take for that plant to reach said maturity. Because we can predict all of these things, we can also predict the effect a plant in a landscape design will have upon its surrounding environment. searching for the opportunity to reduce waste from the perspective of the greatest impact to the environments (i.e. Business, water, plants), while improving the aesthetic value. the activity of identifying waste, not only fossil fuel and water but human energy.High maintenance plants need more landscaping as their useful lives near an end. The cost of watering and treating these plants combines with the cost of replacing them when poor plant choice, poor placement and over-pruning drastically reduce their useful life. In the long run, your business’s cash flow is affected by overspending in these areas, reducing and, in some cases, severely hindering asset growth. 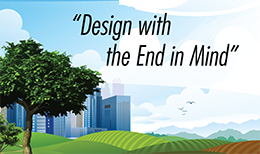 In the longer run, the exhaust and waste created by overusing resources – which is necessary in a high maintenance landscape design – creates pollution, raises the Earth’s temperature, and depletes natural resources, especially fossil fuels. Less than three percent of the Earth’s water is fresh water. That means that less than three percent of all of the water on our planet is drinkable. Seventy percent of that water is locked up in glaciers and aquifers, meaning that only thirty percent of the 2.5 percent of the Earth’s drinkable water is also accessible. If you’re not so good at math, what that means is that only 0.75 percent – three-quarters of one percent – of all of the water on Earth is both drinkable and accessible to human beings, let alone animals and plants.In 2001, the CIA estimated that by 2015, almost half the Earth’s population will live in countries under severe water stress. A billion people worldwide already lack adequate water, and nearly three times that many lack adequate sanitation. Kind of makes you think twice about letting the faucet run while you brush your teeth, doesn’t it?